Whether you’re an experienced air travel industry worker or someone seeking to break into the industry, AirlineJobFinder can provide the help you need. Our extensive website covers a wide range of airline career and air travel industry possibilities, from airline-related jobs and airport jobs to air traffic controller careers and airport security jobs. Currently, the government is hiring more air traffic controllers. Additionally, there is a big need for airport security workers throughout the U.S. and in other countries too. Those working in the air travel industry put in long hours and many are on the road a lot, but the industry has excellent benefits. Learn the air travel industry inside and out using AirlineJobFinder. We provide dozens of air travel industry job descriptions as well as advice for pursuing work. Using our JobCenter you’ll be able view hundreds of employer profiles and search a list of Featured Jobs. AirlineJobFinder gives you an Edge! Search Thousands of Airline Industry Jobs! Airlines are actively recruiting flight attendants. That’s a fact. This job has many rewards, the best being free or reduced ticket fares for themselves and immediate family members. Paid holidays and vacations, sick leave, stock options, career-related tuition reimbursement, retirement plans, medical, dental, and life insurance are among the benefits flight attendants can expect to enjoy. In addition, flight attendants often have from 10-21 days off per month. Log in to AirlineJobFinder and learn much more about flight attendant careers. AirlineJobFinder.com can help whether you’re looking for flight attendant career, baggage handler or other ground support job, private pilot job, ground-based airline work, or any other position in the air travel industry. Just about every aviation career option you can think of is covered on AirlineJobFinder. We will provide you with the necessary industry knowledge, a game plan on how to get the job that’s right for you, and proven strategies on how to maximize your earnings. You have come to the right place to start your search for air travel industry jobs! Start Your Airline Industry Job Search! The air travel industry is a desirable workplace for many people despite ongoing financial hurdles faced by many airlines. There are a great variety of jobs and upward mobility. AirlineJobFinder is designed to help you get in on the action, and directs you to a wide array of job opportunities. Our easy-to-use website features current aviation job postings, hundreds of employer profiles, and a place for applicants to post resumes and cover letters for hiring managers. Dozens of airline careers described. Hundreds of airlines listed in our job center! Dozens of job descriptions. Airports from around the world listed! All told there are over 70 unique aviation job descriptions for you to evaluate for career options. Additionally, we include an in-depth job hunting tools section, which covers the basics of job search planning, resume and cover letter writing, job hunting strategies, interviewing, and more. Which field looks like the best fit for you? Start Searching for Airline Jobs Now! 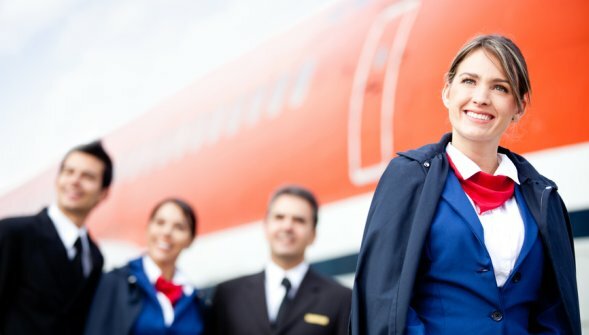 Flight Attendant Jobs, all Airline Careers, Airport Jobs, Security Jobs, Ground Support Jobs…plus Air Traffic Controller careers and other FAA Jobs. We cover it all. We have compiled the absolute best set of resources to help you secure your air travel industry job. We tell you exactly what to expect, provide the means to research the best employers for your needs, and provide you with insider tips to help set you apart from the other applicants. AirlineJobFinder will teach you all you need to know about working in the airline and air travel industry. You’ll get a detailed overview of the entire industry, honest and frank portrayals of the working conditions, interviews with people who work in these jobs, a detailed list of job descriptions, information about security, detailed employer profiles with hiring information for hundreds of air travel industry companies, and links to resources you need. Plus, you get full access to our exclusive list of featured jobs. These are jobs that employers are actively hiring for right now and is updated continually! The information compiled in the Members Section of our site is the ultimate resource for aviation industry job seekers. Our writers have conducted in-depth research and have knowledge of the industry because they have worked in the air travel industry. Create your website account and you’ll get the whole scoop. You’ll not only be better prepared for an aviation industry job, but you’ll also be able to impress prospective employers in an interview with your extensive knowledge. Industry information. This includes the size of the industry sector, how it works, major employment centers, growth outlook, and recent trends. Detailed job descriptions. These include necessary qualifications, typical duties, pay ranges, and benefits information. Advice from actual industry insiders describing the work. You’ll find these worker profiles throughout the AirlineJobFinder website. Company profiles. The company profiles and Featured Jobs are located in our JobCenter. The JobCenter is a primary benefit of the site that enables members to access important up-to-date job information as well as post a personal profile. Featured Jobs – Current job postings! Many of these job postings are not advertised anywhere else. Personal Profile and Resume – List your resume and personal profile in our proprietary JobSeekers Database that employers can search to fill open positions. Whether you are exploring job options, looking for a totally new career, or are already in the industry but seeking a change, AirlineJobFinder can help you find a job that is best suited for you. Quickly find new job opportunities posted by airlines, airports, government aviation agencies, and concessions companies. It’s easy when you use our JobCenter! Also, discover interesting employers you might not know about, and post your personal profile to gain visibility. Let us open your eyes to job possibilities in the airline and aviation industries. Explore our job profiles, learn how the industry is structured, get job search advice, watch videos,and more. The AirlineJobFinder JobCenter features hundreds of employer profiles – airlines, airports, government agencies, and other aviation industry companies. Many of them have job openings right now. How exactly do you get a job? We answer that question and more. Whether you want to work for an airline, a government aviation agency like the TSA, or at your local airport, we tell you how to handle your job search! A fraudulent company is claiming to be associated with AirlineJobFinder and requesting payment from job seekers. DO NOT PAY THEM ANY MONEY! They are a SCAM. Our service is 100% FREE to use. We do not charge job seekers for anything. Find an Airline Industry Job. It is now 100% FREE!